CHiPS Review | Let it sink in the deep ocean of forgotten movies. "I didn't pay money to watch CHiPS but that doesn't mean that there wasn't a price to pay." "CHiPS isn't very funny, which is a problem because everything from the marketing material to the content of the movie suggest that it's intended to be a comedy. " There may be people out there who are going to read my CHiPS review, but I sure haven’t met them. The worst thing about running and writing for a barely-read film website is that when you attend a screening of a film like CHiPS, after a long day at work, not only do you have to sit through a film like CHIPS but you also have to trudge home ,late at night, to write a review that nobody is going to even skim through. Do you care about CHiPS? I didn’t think so. Those free movies don’t always feel as free as they should. I didn’t pay money to watch CHiPS but that doesn’t mean that there wasn’t a price to pay. When you’re in a position of seeing most movies that are released in cinemas, the ubiquity of sub-quality films in multiplexes becomes painfully conspicuous. A good film can be transcendent. A bad film can be like being stuck in a traffic jam; your life is draining away by the second. Peña contemplates his recent career choices. CHiPS is a bad film and I was aware that it would be before I’d even seen it. I don’t think anyone bemoaning the fact that I’d prejudged CHiPS – which will be nobody, because nobody is reading this – when I ought to have gone in with an open mind would be able to pass a polygraph test if they answered ‘no’ if asked whether they had made similarly negative assumptions about the film. I did go into CHiPS with an open mind, and would have been thrilled if the film had ended up being a positive revelation (good would have sufficed), but that outcome wasn’t what I expected and my expectations were, regrettably, met. The movie is based on a television series, which I had never heard of, that ran from the late 1970s to the early 1980s. Jon Baker (Dax Shepard, who also wrote and directed the film) and Frank “Ponch” Poncherello (Michael Peña) are recent additions to the California Highway Patrol in Los Angeles. Baker is a former successful motorbike rider who somehow views his joining the Patrol as a viable option for re-invigorating his marital life. Ponch is actually an FBI agent, who is undercover in the Patrol in an effort to investigate a heist that may be an inside job. CHiPS isn’t very funny, which is a problem because everything from the marketing material to the content of the movie suggest that it’s intended to be a comedy. I have written, in previous reviews of Hollywood comedies, that it would be the last time I would mention how unfortunate the use of homosexuality as a punchline is, but I’m compelled to bring it up again. As a comedic motif, it’s not funny and it’s not helping stem ignorant behaviour toward homosexuality. What it is is dumb, and also an unappealing substitute for actual humour. Torching the negatives seemed like the only option of Peña and Shepard. 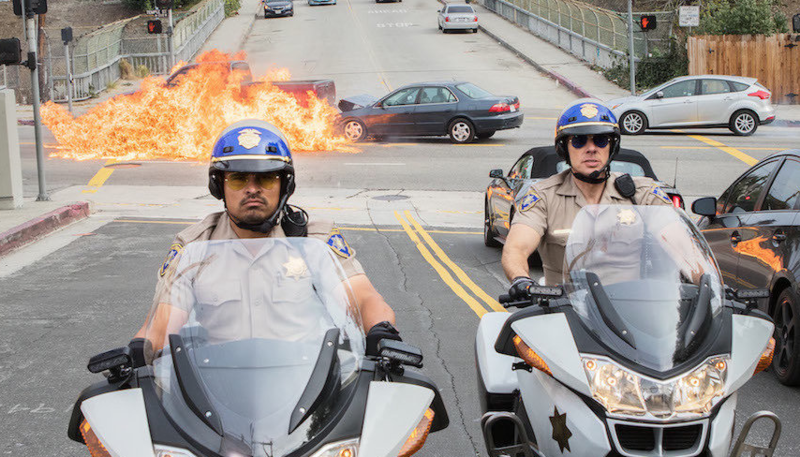 CHiPS moves quickly and the chemistry between the two leads is enjoyable, to a degree, and for that reason it is slightly less painful experience than it might have been if an actor as charming as Peña wasn’t involved. It’s not pleasant, watching Peña engage in this sort of material, but what the hell am I going to do about it? It’s eleven pm and I’m spending my time writing a review that nobody will every read. Life goes on. CHiPS is out and there’s nothing we can do about it. It won’t be the last bad movie I see this year, or even this month. But everything is hunky dory. With a bit of luck, we’ll be able to move on and let CHiPS sink into the deep ocean of forgotten cinema.